While motorists struggle with higher prices to fill their tanks, the poor whose businesses and livelihood survive on illuminating paraffin will take the hardest beating after the seventh fuel price increase this year came into effect on October 3. An announcement by the Central Energy Fund (CEF) has, on behalf of the South Africa Energy Department, stated the country’s illuminating paraffin would increase by R1.04, 93 Octane petrol by R0.99, while 95 Octane increased by R1.00 and diesel by R1.24. The fuel increase was said to be due to the rand weakening to the US dollar. The “exchange rate for the period 31 August 2018 to 27 September 2018 was 14.7899 compared to 13.9430 during the previous period,” read the CEF statement. 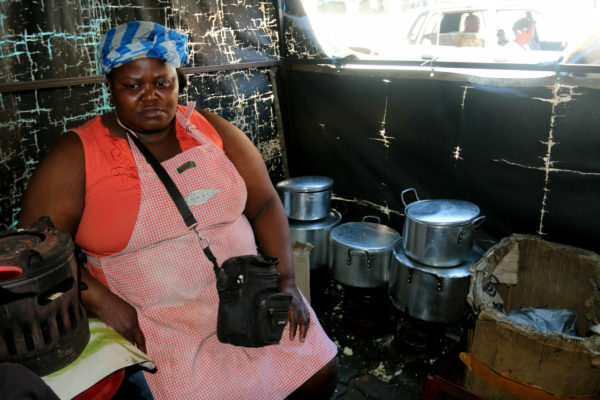 Tselane Mosholi who runs a cooking business on Twist Street opposite Noord Street taxi rank, makes less profit to support her business and her family due to the July fuel hike. “Paraffin increased by R1 a litre around June, from R16 to R 17. That was an inconvenience because I cannot keep increasing my food prices every time the price of fuel increases,” she said. The 48-year-old who uses two litres of paraffin a day, which cost R32, last increased her food prices after the July fuel hike but customers complained and she had to reduce them back to the ‘normal’ prices in order to retain her customers. “I now spend R120 on live chicken, which used to cost R65 just last year in April. Because customers did not come anymore when I increased all my [merchandise] by R2, I had to decrease back to last year’s prices to have my customers again,” Mosholi told Wits Vuvuzela. Other business owners at the taxi rank compete with each other in terms of prices and cannot afford to be the least favoured. Zanele Buthelezi, another food business owner on Twist Street, told Wits Vuvuzela, “The constant paraffin price increase affects us negatively. “Firstly, we cannot just increase our prices because there are many of us who cook and customers can just easily go to the next place.Secondly, I still need to pay my two employees R400 out of R1 500 I make at the end of every week which leaves me with very little considering I still need to stock more items to keep my business running,” she added. The little money the owners make also affects their personal lives. Mosholi battles to cover the school fees of her two children and has asked her sister to take care of her younger daughter while she fends for the older son. The fuel increases have also resulted in a R2 increase in taxi fares earlier this year. To combat the fuel hike, People Against Petrol Paraffin Price Increase (PAPPPI) are ready to take to the streets for another national shutdown. Among the list of demands, PAPPPI propose that fuel prices decrease by 35%, “restore the strategic fuel reserve stolen” and revitalise farms and create 1 500 jobs. As per the Automobile Association of South Africa, this month’s fuel hike is more catastrophic given that “excluding months where fuel taxes were hiked, this will be the single largest fuel price increase” to ever be experienced by South Africa. Wits Vuvuzela: Economy reels from fifth petrol price increase. August 4, 2018. Wits Vuvuzela: Public to comment on proposed zero-rated VAT items. August 17, 2018.